Drive in the Rain? Use Your Brain. Unlike the popular 80’s song Blame it On the Rain, don’t. What did rain ever do to you besides water your garden and kind-of wash your car?? Though rain is blamed for a gazillion accidents each year, most of these fender-benders are preventable and not the rain’s fault at all. Rather, the true culprits of foul-weather flip-overs are un-brainy drivers failing to concede that they need to save their normal driving habits for another un-rainy day. Be very cautious when it first rains after a period of dry weather. Oil and grease gradually build up on the road and when it rainfall hits, your joyful ride can instantly turn into a not so fun slip and slide. As they say, “When it rains, bad traffic pours.” You know traffic will be congested in inclement weather, so give yourself a few extra minutes to arrive safely to your destination. Tailgating, is bad enough. Tailgating when the roads are slick? That’s just plain idiotic. Give yourself bigger space cushions with the cars ahead of you so you have more time to stop safely. 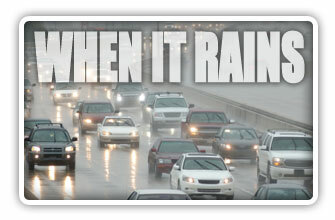 Braking by slamming on the brake pedal will make your already rainy day even rainier. Go ahead, show off! Yes, we want you to draw attention to yourself, really!! When it’s raining, everyone’s visibility is hampered. Remember to turn your headlights on (low beams please) and keep your windows defogged. Also, be on the lookout for cars without lights on, pedestrians, and other road hazards that might get lost in the rainy shuffle. Unless you drive a hovercraft, the inner lanes of the road are probably your best bet. Most roads slope downward toward the curb where you’ll find those deep, hard to avoid puddles. You cruise, you lose. If you hydroplane while using cruise control, your car may suddenly and abruptly speed up. Good luck to you When your tires return to the wet road at an accelerated speed. Hopefully you remembered to wear your seatbelt. If your car does start to hydroplane, don’t freak out: jerking the wheel or hitting the brakes are BAD ideas! Instead, ease your foot off the gas and hold the steering wheel firmly until your car regains traction with the road. What did we learn? Driving conditions will be less than ideal as long as raindrops keep falling on your hood. If you can, stay off the streets when the weather takes a turn for the wet. If you have places to go and people you must see, just remember that not all driving situations were created equal, and when it comes to wet roads, you need to carry yourself with a little extra common sense!